Every year InterAction convenes humanitarian and international development practitioners so we can learn from each other and together, find solutions to common challenges. The InterAction community shares a deep belief that staying globally connected improves human wellbeing and makes each of us more effective in the global quest for a better world. InterAction Forum 2017, which took place from June 20-22, featured influential and inspiring organizations, changemakers, and executives from the public, private and NGO sectors. The event theme “United We Stand” reflected InterAction and its members’ commitment as internationalists, working across borders to do good in the world. 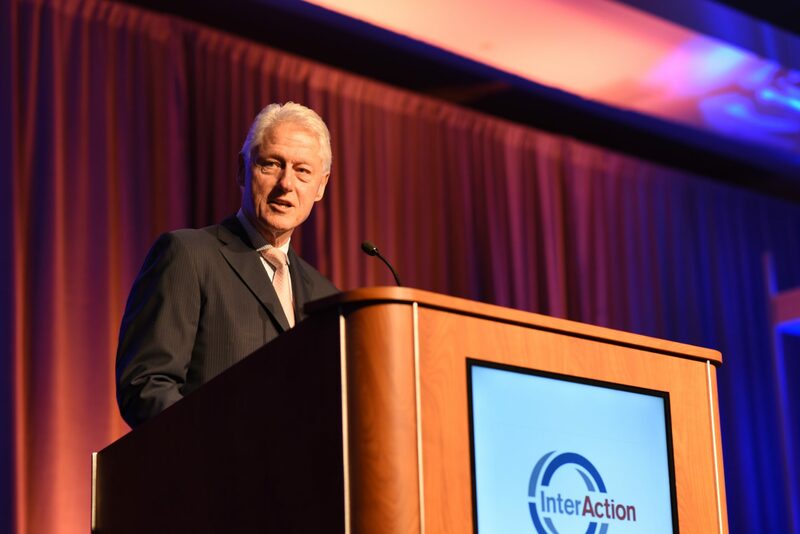 Former President Bill Clinton opened the event, urging international nonprofits to remain positive in the face of severe cuts in humanitarian and development assistance proposed by the Trump administration. Clinton added that pursuing an “us vs. them, zero-sum game” approach would fail in the end. “Every successive age in history has allowed us to expand the definition of ‘us’ and shrink the definition of ‘them,’” Clinton said. Other general sessions at Forum featured a range of inspiring panelists, such as Joyce Banda, former president of the Republic of Malawi, Mary Robinson, former president of Ireland and now president of the Mary Robinson Foundation-Climate Justice, and Kristalina Georgieva, CEO of the World Bank. Among the more than 50 breakout sessions, participants discussed topics such as the growing global refugee crisis, innovative finance, and the presentation of civil society space online. Recipients of the Annual InterAction Forum Awards provided a sobering reminder of the need to stand united and draw strength in the face of systemic shifts and uncertainty. Humanitarian Award winners Marielena Hincapié, executive director of the National Immigration Law Center and Omar Jadwat, director of the ACLU Immigrant Rights’ Project, discussed their work to oppose executive orders against immigrants and refugees and uphold our country’s legacy of refugee resettlement.